In May 2008, the Office of University Events received a Gold Medal from the CASE Circle of Excellence program for The Visit of His Holiness the Dalai Lama in 2007. This was the first time an Emory event was recognized by the international Circle of Excellence award program. In June of 2009, the Office of University Events received a Bronze Medal for the Campaign Emory Kickoff Gala and Celebration. In 2011, the Office of University Events won the Grand Gold Medal for the 2010 Visit of His Holiness the Dalai Lama. Grand Gold is a special designation, not always awarded, for a gold medal entry that is "clearly pre-eminent among gold-level winners" and deserving of special recognition. "The [Circle of Excellence] awards acknowledge superior accomplishments that have lasting impact, demonstrate the highest level of professionalism and deliver exceptional results. Winning programs epitomize the profession's best practices, raise standards and contribute to a growing body of knowledge about advancement." In September 2009, Michael Kloss accepted the Esprit award from the International Special Events Society for Best Entertainment Production for the original production Enquérir, produced for the Campaign Emory Kickoff Gala and Celebration. At the same awards presentation, the Office of University Events was recognized as a top three finalist in two other categories: Best Event for a Non-Profit Organization; and Best Team Effort in the appropriate budget categories. "As the mark of global distinction and the highest level of professional acknowledgement within the special events industry today, the ISES Esprit Awards are designed to acknowledge the extraordinary efforts, performance, and outstanding contributions of ISES members in the special events planning industry. The ISES Esprit Awards celebrate those event professionals who have turned their ideas into accomplishments." In 2009 and 2010, Michael Kloss was recognized as a national finalist in the category of Organizational Event Planner of the Year. In 2012 he named the winner of this prestigious award which includes a nationwide public vote. "Top event professionals from around the globe entered the 2009 Event Solutions Spotlight Awards. Colleagues nominated their valued strategic partners. The impressive list of nominees and entrants included industry luminaries who provide for and create every element of a fabulous event or meeting. The Event Solutions Spotlight Awards are unique to the event world. These prestigious awards recognize and honor the top individuals and companies which lead our vibrant industry." 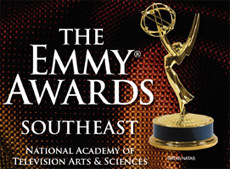 In 2008, the Southeast Region of the National Academy of Television Arts and Sciences recognized the television productions associated with the Visit of His Holiness the Dalai Lama with two regional Emmy® Awards for Best Public Service Announcement and Best Technical Achievement for our media partner Turner Broadcasting. The Office of University Events was proud to have been associated with this award-winning production and salutes our friends at Turner on this impressive win.